It has been nearly five years since the City of Los Angeles dedicated the corridor at Second and Azusa Streets in honor of Little Tokyo community leader Frances Hashimoto and two years since the Rotary Club of Little Tokyo Los Angeles launched regular cleanup days for Hashimoto Plaza. On Sunday, April 23, Rotary Club President Masao “Mike” Okamoto thanked those who made the plaza dedication possible and those who have been diligently making sure the area was maintained as a fitting pathway to the Aratani Theatre and Japanese American Cultural and Community Center. Reigning Nisei Week Queen Jaclyn Tomita and her court were on hand along with former City Councilmember Jan Perry to thank the Rotarians for their service. 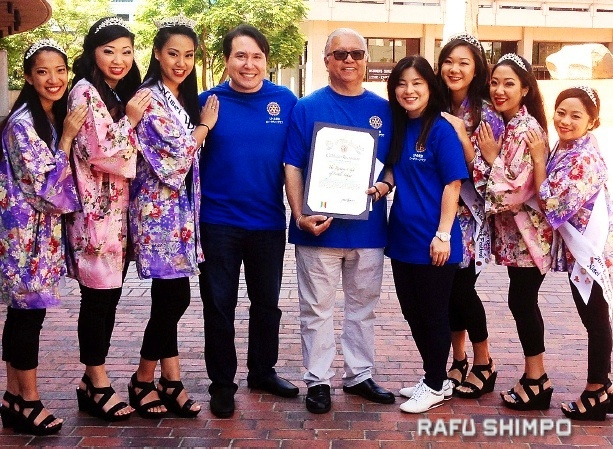 City Councilmember Jose Huizar, of the 14th District, who currently represents Little Tokyo, memorialized the occasion with a certificate of appreciation to the club. Ryan Friedman, Hashimoto’s son, was on hand to represent the family. Okamoto said that the Rotary Club members intend to continue maintaining Hashimoto Plaza as a service to the community.